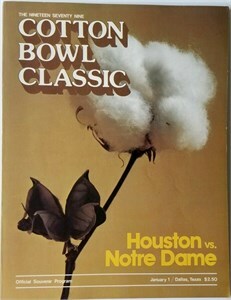 Original complete game program from the 1979 Cotton Bowl, one of the most famous college football games of all time. 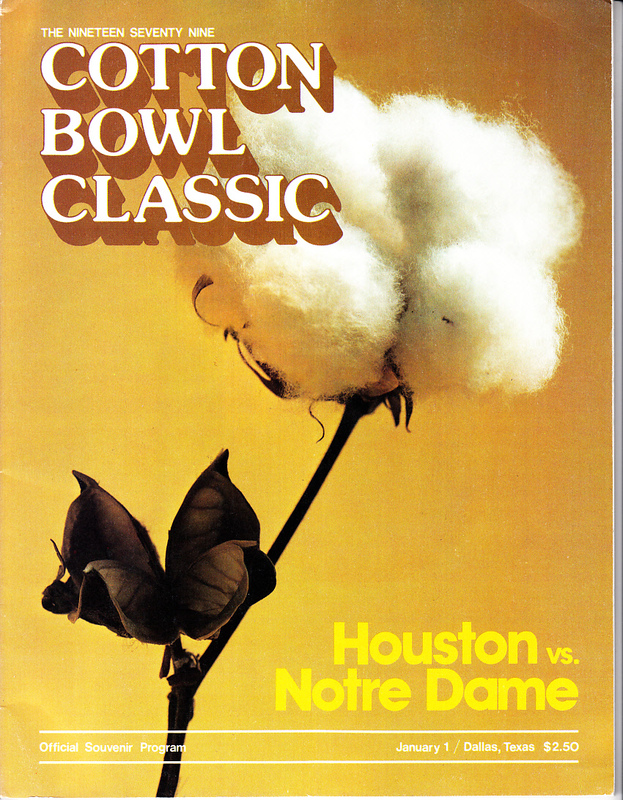 Notre Dame QB Joe Montana, suffering from the flu and facing unusually frigid New Year's Day weather in Dallas, led the Irish all the way back from a 34-12 deficit to Houston with a little help from chicken soup he drank in the locker room at halftime. Montana capped the incredible comeback with a touchdown pass to Kris Haines as time expired, and the extra point made the final score 35-34. NOTE: COVER HAS 1 1/2 INCH HAIRLINE CREASE ACROSS TOP RIGHT CORNER PLUS OTHER VERY MINOR FLAWS AND WEAR. IN GOOD CONDITION FOR ITS AGE. ONLY ONE IN THIS CONDITION AVAILABLE FOR SALE.